“I’ve been rich and I’ve been poor, and believe me, rich is better.” The quote has been attributed, variously, to Pearl Bailey, Sophie Tucker and Mae West. Whoever of the three women first uttered it, she knew from experience just what the words meant. 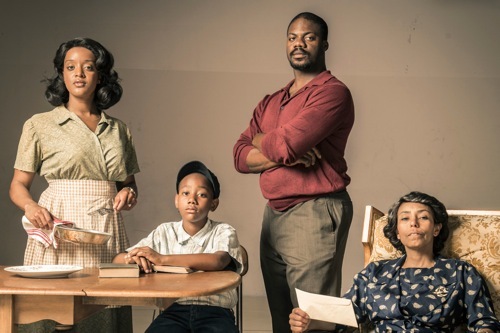 So does the African American family, the Youngers, at the heart of Lorraine Hansberry’s groundbreaking 1959 play, A Raisin in the Sun, now in a fine, strong production at Cal Shakespeare in the Orinda hills. A Raisin in the Sun was the first play by a black woman ever staged on Broadway. Starring Sidney Poitier, it ran for over a year, and James Baldwin praised its fidelity to “the truth of black people’s lives.” Set in a dingy, cockroach-infested flat in Chicago’s South Side in 1959, it chronicles a couple of weeks in the lives of the Youngers, headed by its fierce matriarch, Mama Lena. Her two grown children, Walter Lee, a chauffeur, and Beneatha, a college student, live with her, along with Walter Lee’s wife, Ruth, and their young son, Travis. From the play’s first moments, when we witness the family’s morning rush punctuated by bickering, their plight is made clear: living too close together with no bathroom of their own and a constant struggle to make ends meet. Is there no hope? Yes, it turns out, in the form of cash. The death of Mama Lena’s husband has resulted in a long-overdue insurance check for ten thousand dollars due to show up next day. This windfall is a solution, but it’s also the problem that becomes the central issue of the play: how to spend those big bucks? Walter Lee is almost violently eager to purchase a liquor store. He sees it as his way out and up, a path to becoming a man who can support his family respectably. His sister needs money to finance her dream of becoming a doctor. His wife would like a decent home for her and her son and the baby she’s carrying. Mama Lena has her eye on a house in Clybourne Park, a better part of town. Should she put a down payment on it? The play is powerful and wrenching, and funny at times, too, as the Youngers battle to do the right thing, and though racism raises its ugly head in the form of an insidiously glib representative of Clybourne Park’s white majority, I would argue that A Raisin in the Sun is about poor people of any color who struggle to make their dreams, however small, come true. It transcends race. Cal Shakes does a fine job with it, under the direction of Patricia McGregor, fresh off the triumph of A House That Will Not Stand at Berkeley Rep. She has a sturdy, straightforward way with the play that serves it well. She’s aided by a strong support team: Dede M. Ayite (set), Katherine Nowacki (costumes), Gabe Maxon (lighting) and Will McCandless (sound). Her capable cast is headed by the great Margo Hall as Lena. Hall has never been more magnetic nor shown more authority as she does in this role. She’s a Bay Area treasure. Marcus Henderson embodies a richly-conceived Walter Lee, a lost boy/man whose rage explodes out of a bursting heart and a wounded soul. Nemuna Ceesay is his sassy sister, Beneatha; Ryan Nicole Peters is his sweet, embittered wife, Ruth; Rotimi Agbabiaka ((Joseph) and York Walker (George) play Beneatha’s two contrasting suitors; Liam Vincent is the honey-tongued Clybourne Park rep, Karl; and (on opening night) the excellent Zion Richardson played the bright-eyed boy, Travis. A Raisin in the Sun marks the beginning of California Shakespeare Theater’s 40th season. (The company has had various names; it began its history, believe it or not, as the Emeryville Shakespeare Company.) It rounds out its 2014 roster of plays with The Comedy of Errors, Pygmalion and A Midsummer Night’s Dream. For tickets/information call 548-9666 or visit calshakes.org.